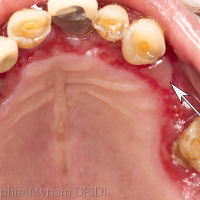 The most likely hypothesis diagnosis is an acquired autoimmune bullous dermatosis confined to gingiva and associated to a generalised moderate chronic periodontitis. Several acquired autoimmune bullous dermatosis, may involve gingival lesions: pemphigus vulgaris, cicatricial pemphigoid, Ig A linear dermatosis and epidermolysis bullosa acquisita (link 1). Early diagnosis made by a dentist is essential because each dermatosis has serious overall impact and can affect vital progonosis. Two biopsies were done to guide the diagnosis (link 2). Things to do: It is imperative to refer the patient to a reference hospital for bullous diseases *. A multidisciplinary clinical evaluation is required to detect skin or mucosal involvement. Systemic therapy adapted to the clinical diagnosis and a constant medical monitoring are necessary. 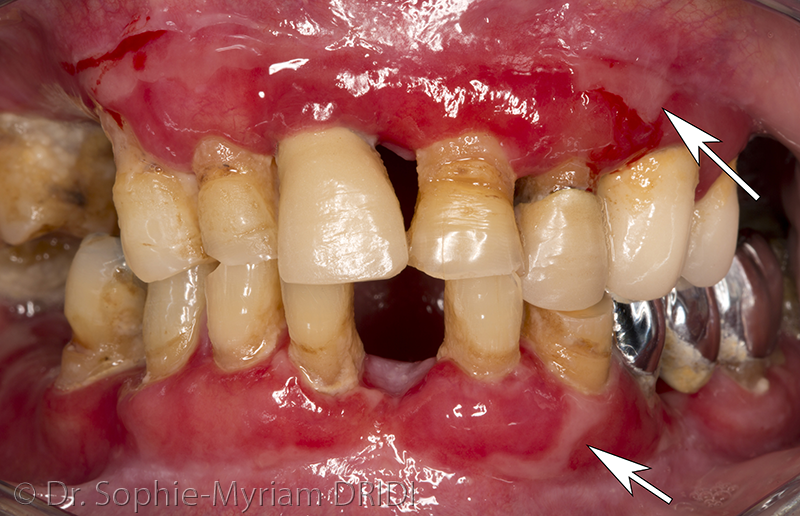 Periodontal treatment can be started but once the dermatosis is stabilized. The histological examinations confirmed the diagnosis of acquired autoimmune bullous dermatosis. Two biopsies are needed. A dentist who has received special training can perform biopsies. A poorly performed biopsy is synonymous with a delayed diagnosis and the loss of opportunity to get the best treatment. 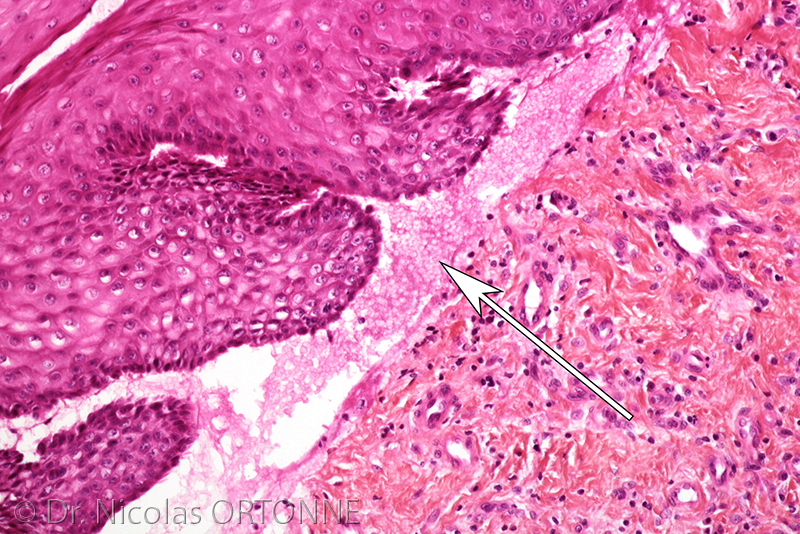 The first histological examination shows an intraepithelial acantholysis for the pemphigus vulgaris cases, or a cleavage subepithelial, without keratinocyte acantholysis or necrosis, for other dermal-epithelial junction dermatosis (cicatricial pemphigoid, Ig A linear dermatosis, epidermolysis bullosa acquisita) (see picture). The second histological examination for direct immunofluorescence revealed deposits immunoglobulin located between keratinocytes for pemphigus vulgaris or at the junction to dermal-epithelial for the other dermatosis. Definitive diagnosis requires very specific tests ordered by referring physicians. 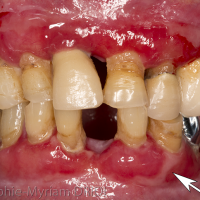 For this case, the diagnosis of cicatricial pemphigoid was confirmed and the treatment with Disulone® has quickly lead to the complete gingival wound healing. There are two groups of acquired bullous autoimmune dermatosis (ABID). 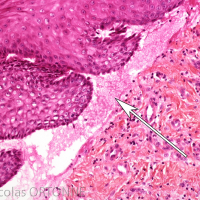 The first group includes intraepithelial ABID including pemphigus vulgaris. These diseases are caused by autoantibodies directed against inter-keratinocyte junction. The loss of keratinocyte junction (or acantholysis) leads to the formation of bubbles within the epithelium, which are fast becoming postbullous erosions after detachment of the epithelial roof. The second group includes subepithelial ABID (cicatricial pemphigoid, Ig A linear dermatosis, epidermolysis bullosa acquisita). The autoantibodies are directed against the hemidesmosomes which allow anchoring keratinocytes to the basal lamina. The bubbles are located at the junction epithelium / lamina propria and quickly lead to postbullous erosions. When do you refer your patients? 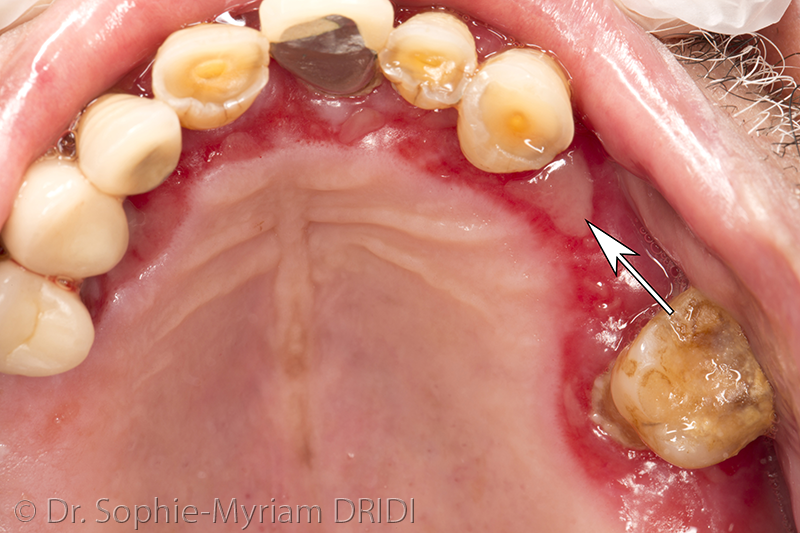 How do choose your referral in case of oral lesion/anomaly/disease? What are the clinical criteria? What is your referral center for bullous disease?